Another wonderful dip recipe coming at ya... it's healthy, cool and perfect for summer. Anything involving avocados and I'm game! Take the flesh out of the avocados into a bowl. Add a dollop of greek yogurt per avocado. Add the ranch like you are generously seasoning something. The original calls for the whole packet but as I tasted while mixing it did not need the whole packet. (To give you a better idea I have about used a whole packet now after going through 5 avocados). Taste it to see if it needs more as you are seasoning. Mash avocado mixture with fork and stir until creamy. This is best cold so chill until cold or speed it up by putting in the freezer for a bit. Serve with chips or on tacos, etc. This is easily adapted for however many avocados you want to use. The best estimate I have found for using as an appetizer is 1/2 avocado per person. Make sure to get some before it is all gone! This dip was gone in 15 minutes tops. Our friends could hardly wait until I was able to take pictures of it. It's that delicious. I'm making this again tonight!Enjoy! One of the best things about warm weather is flip flops. This LaForce Likes is this simple sign. I think it would be easy enough to DIY in your color of choice or you can buy it off etsy. They used a nice birch but other woods could work just fine. I can see this as seasonal decor or something you have up all year to remind you of that wonderful feeling of flip flops on your feet. 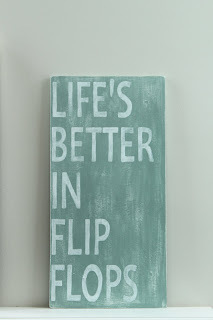 Life really IS better in flip flops! Hubby will attest to this as he wears them pretty much all year long... must not be as affected by cold wearing them far into chillier weather. Our adorable niece Abby turned 5 at the end of May and we had a wonderful birthday weekend with her in Columbia. Saturday morning we went out on the lake. The weather was really nice for a boat ride an lunch but the water was still too cold. Abby and Eric tested it out and were quickly back on the boat shivering. After the lake, we spent a little time at the neighborhood pool. Abby loves bugs. She was fascinated by the rolly pollies and caterpillar type worms she found. That evening before having burgers on the grill, Abby rode her bike. Pretty soon I bet those training wheels will be coming off. We also played on her new swing set and played tag in the backyard. Sunday was Abby's birthday at a place called Partyz Unlimited. It has a bunch of bounce house type things and slides and a kids rock wall. They had pizza and cake after playing. All the kids also get popcorn, snow cones and cotton candy supplied by the place. Then they are given back to their parents as sugar monsters. Here are a few pics from the party. There were about 25 kids there total with most being around 5 like Abby and the rest were siblings of those kids or neighbors. Abby had a cupcake cake in the shape of a heart. They were vanilla so there were also a few extra chocolate cupcakes for those that really wanted chocolate. Abby picked out presents she wanted at Learning Express and they kept them in a bucket with her name on it kind of like a gift registry. We were able to go to a Learning Express in Charlotte and they took what we bought out of her bucket in Columbia. This was wonderful - I hope she continues to register there for birthdays in the future! Happy 5th Birthday Little Miss Abby! You are growing up so fast! This week is this beautiful and fun chevron platter from Coton Colors. They have other colors but of course I love the purple one! 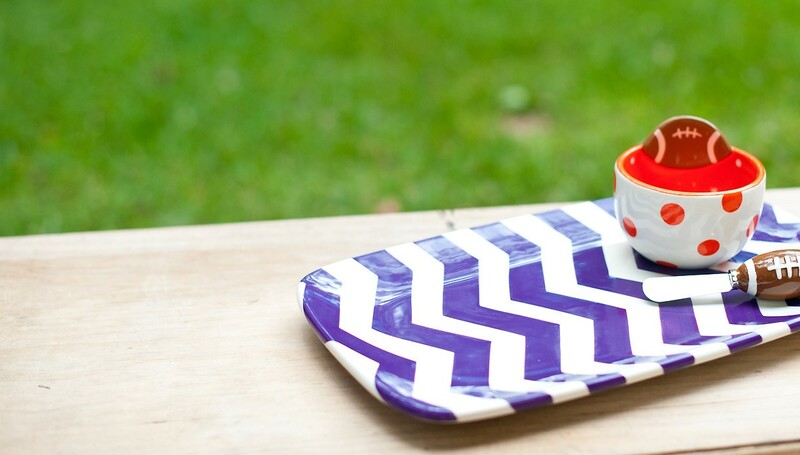 How perfect is it paired with the orange polka dot dip cup and spreader for football season. Like I really need another dish this size when I have a few Clemson ones but the nice thing is the platter could be used easily other times of the year (Easter, showers, etc.) and not just football season since it doesn't have any logos. Most Clemson serving pieces are orange so purple would be fabulous. And of course chevron is all the rage! One of Eric's aunts said that Coton Colors is a local company in Tallahassee so lucky you if you live near there to attend any sale events. If for some crazy reason you aren't partial to purple and orange they do have many more colors to choose from. I have not been paid to write about this product. It is just something I like and want to share.